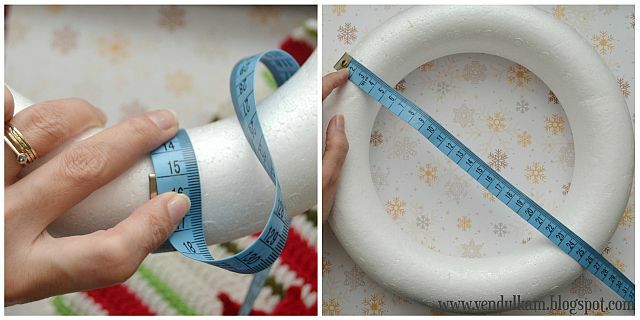 First of all, you should measure your wreath and adjust the number of the stitches. 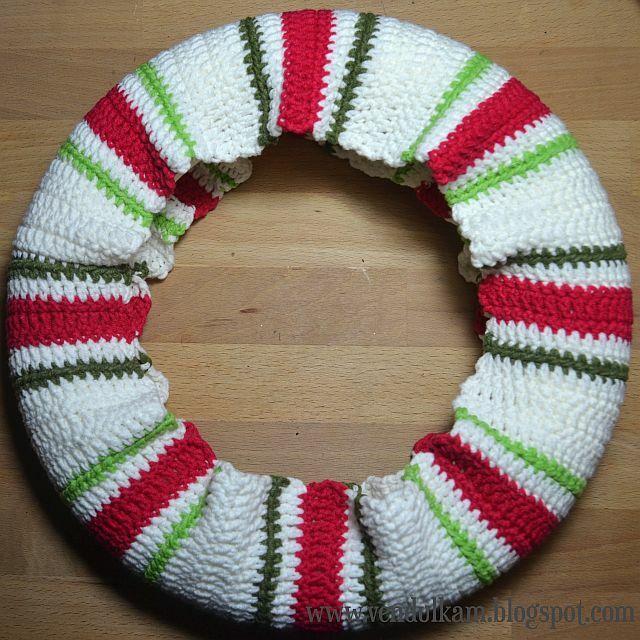 Beginning: use white yarn and crochet 34 CH (It is enough for my wreath). Row 6: use bright green yarn and crochet 2 CH as a first HDC, 1 HDC in every stitch from previous row (32 HDC), end the work. Turn the work. 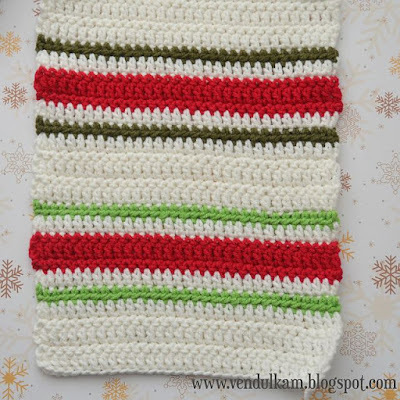 Row 7: use white yarn and crochet 3 CH as a first DC, 1 DC in every stitch from previous row (32 DC), end the work. Turn the work. Row 11: use white yarn and crochet 3 CH as a first DC, 1 DC in every stitch from previous row (32 DC), end the work. Turn the work. Row 12: use bright green yarn and crochet 2 CH as a first HDC, 1 HDC in every stitch from previous row (32 HDC), end the work. Turn the work. Repeat row 1-12 until row 96, then end the work. You will crochet by same way to the desired length. Only change you will make - it will be in the alternating green colors in rows of HDC - bright green and khaki green. 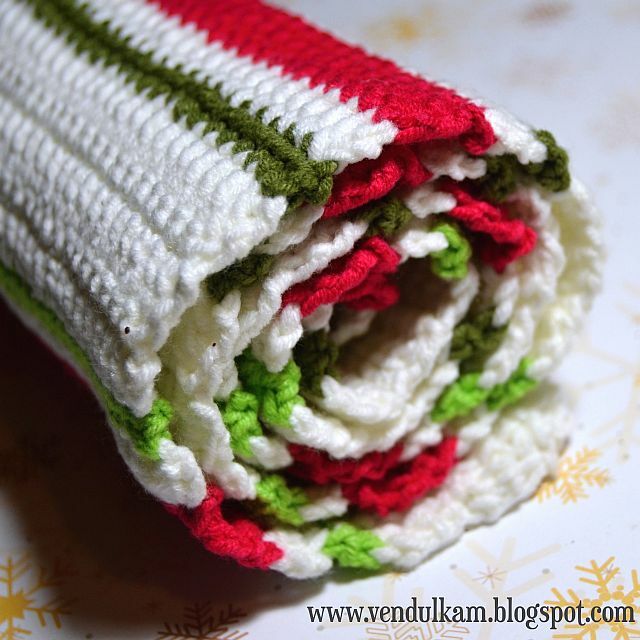 When you have finished your work, then place both ends to each other and crochet or sew them together. I crocheted it. I used white yarn and crochet 1 SC in next 32 stitches, end the work. The picture in the middle is wrong side of my work, the picture on right is right side of my work. Neaten free threads. 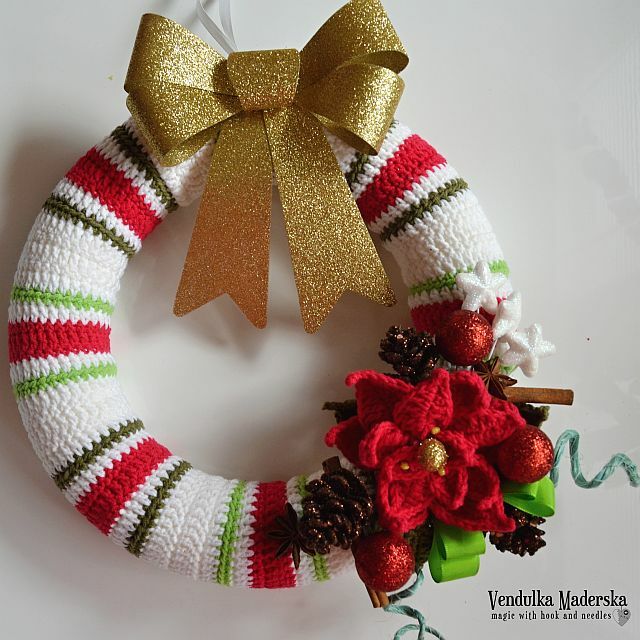 Then cover your wreath with your crocheted piece. Sew the edges together. Use tapestry needle, white yarn and sew from inner edge to the second inner edge across, as you see on the picture below. Make nice tiny stitches. 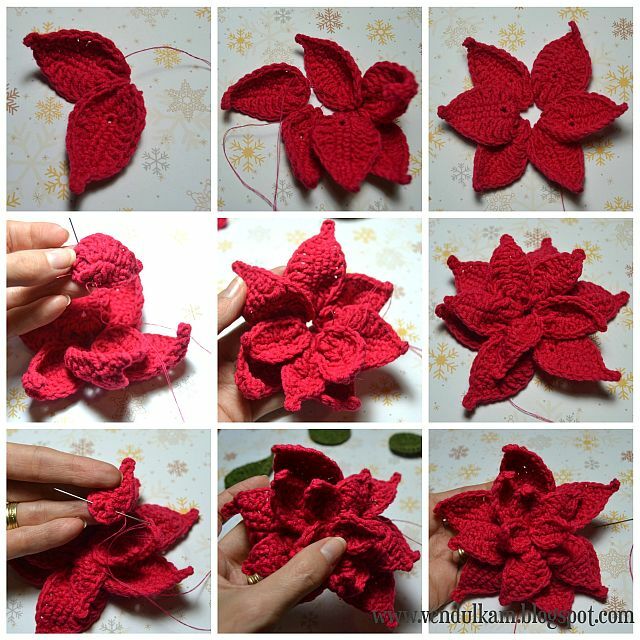 You will make red poinsettia. Round 2: 3 CH as a stitch, 3 TR in very first stitch, 1 TR in next 2 stitches, 1 DC in next 2 stitches, 1 HDC in next stitch, 1 SC in next stitch, 4 CH insert a hook in second stitch from the hook and crochet 1 SlSt in next 2 stitches, 1 SC in next stitches. Insert a hook in leaf again and crochet 1 SC in next stitch, 1 HDC in next stitch, 1 DC in next 2 stitches, 1 TR in next 2 stitches, 4 TR in last stitch, 1SlSt in first stitch of the round, end the work. 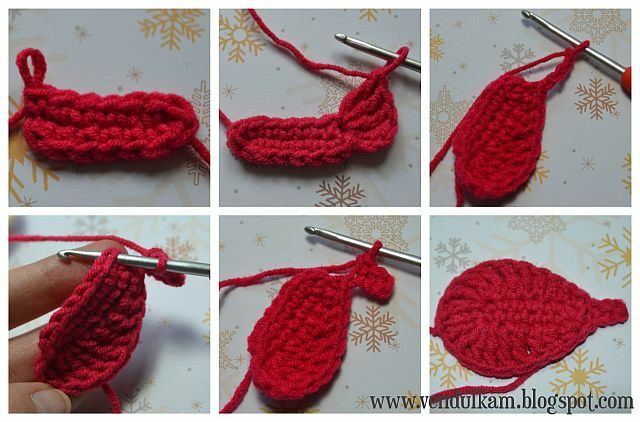 Round 1: insert a hook in 4 stitch from the hook and crochet 2 TR, 1 TR in next stitch, 1 DC in next 2 stitches, 1 HDC in next stitch, 1 SC in next stitch, 3 CH, insert a hook in second stitch from the hook and crochet 1 SlSt in next 2 stitches. Insert a hook in a leaf again nd crochet 1 SC in this stitch, 1 HDC in next stitch, 1 DC in next 2 stitches, 1 TR in next stitch, 3 TR in next stitch, 1 SlSt in first stitch of the round, end the work. 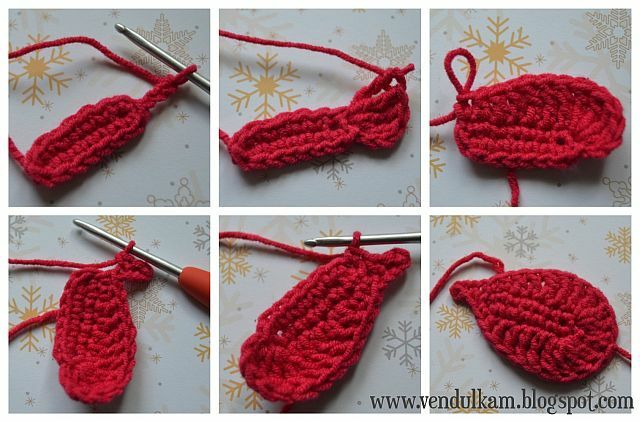 Round 1: insert a hook in 4 stitch from the hook and crochet 2 DC in this stitch, 1 DC in next stitch, 1 HDC in next stitch, 1 SC in next stitch, 3 CH, insert a hook in second stitch from the hook and crochet 1 SlSt in next 2 stitches. 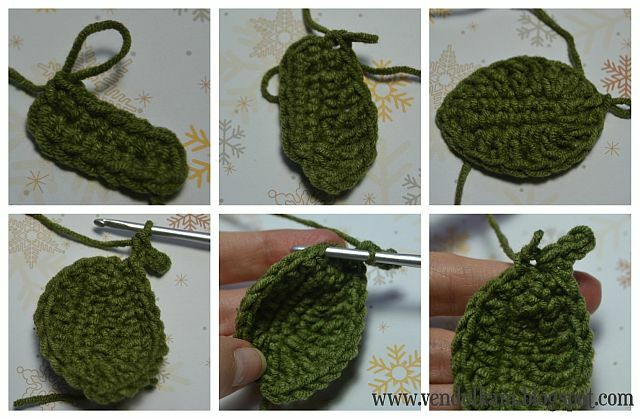 Insert a hook in a leaf again nd crochet 1 SC in this stitch, 1 HDC in next stitch, 1 DC in next stitch, 3 DC in last stitch, 1 SlSt in first stitch of the round, end the work. Round 1: insert a hook in second stitch from the hook and crochet 1 SC in next 7 stitches, don't turn the work, continue in circle direction and make 1 SC in next 7 stitches (14 stitches), 1 SlSt in first stitch of the round. Round 2: 3 CH as a stitch, 3 TR in very first stitch, 1 TR in next 2 stitches, 1 DC in next 2 stitches, 1 HDC in next stitch, 1 SC in next stitch, 1 SC in next 2 stitches, 1 HDC in next stitch, 1 DC in next 2 stitches, 1 TR in next 2 stitches, 4 TR in last stitch (21 stitches), 1SlSt in first stitch of the round. Round 3: 1 CH, 2 SC in one stitch - repeat 3 times totally, 1 SC in next 7 stitches, 4 CH insert a hook in second stitch from the hook and crochet 1 SlSt in next 2 stitches, 1 SC in next stitches. 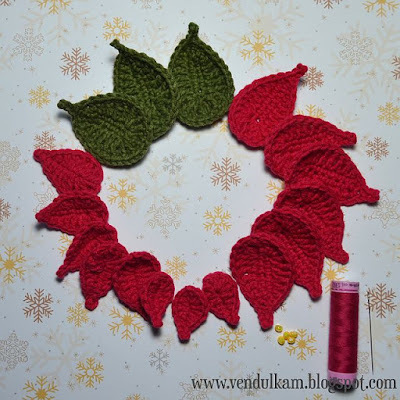 Insert a hook in leaf again and crochet 1 SC in next 7 stitches, 2 SC in one stitch - repeat 3 times totally, 1 SlSt in first stitch of the round, end the work. Neaten free threads. 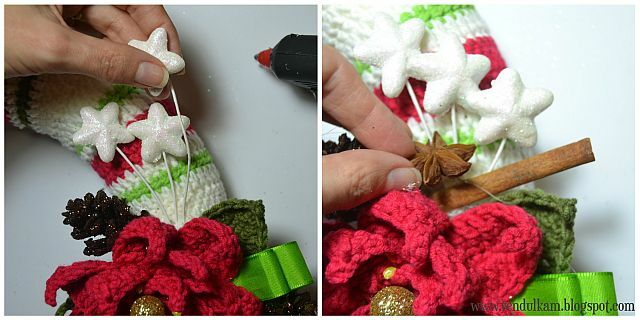 Use common sewing thread and needle and sew the leaves together one by one. Begin with largest red leaves. Then add middle leaves and small leaves at the end. 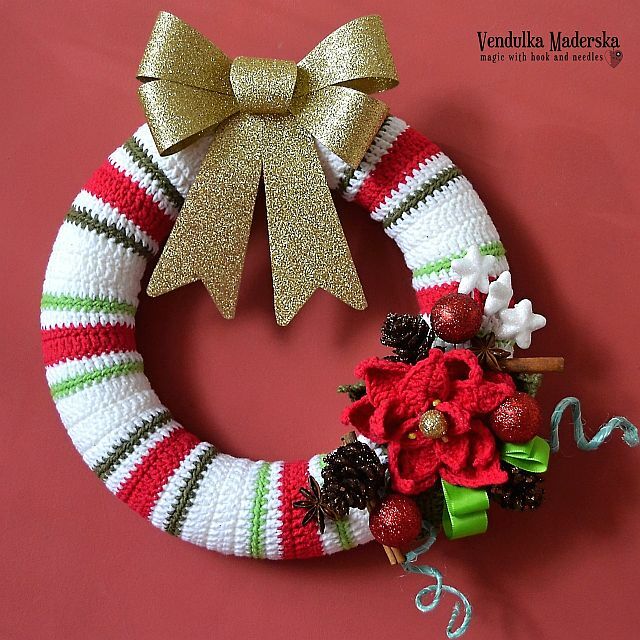 Use 5/8 (1,5 cm) width ribbon, cut two pieces about 20 cm long each. And fold them nice, twice. Pin the ends. Now take a wire. I used the wire wrapped by blue straw, which I bought in my favorite shop for flowers arrangement. 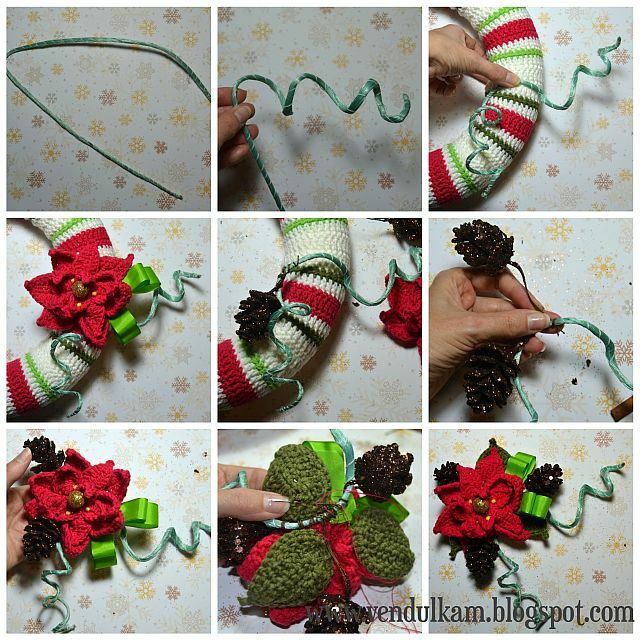 Fold it in half gently and curl the ends a little bit by your fingers. 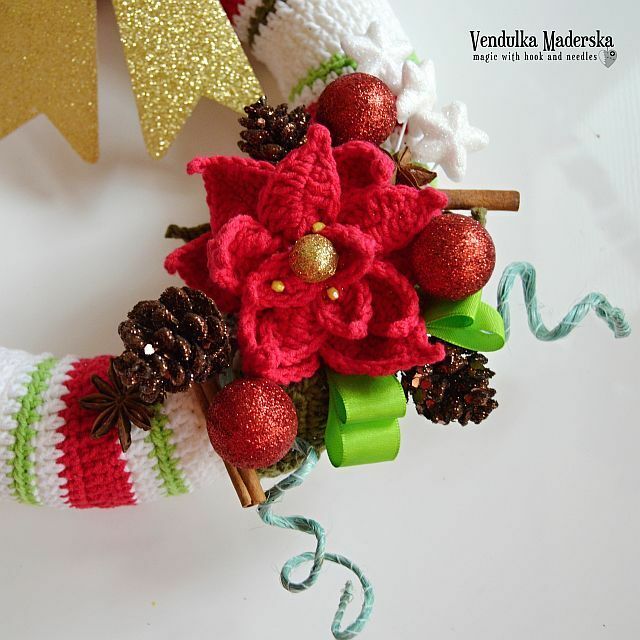 The middle of the wire should be shaped according to the wreath. Then use some embellishment on wire - I used glitter cones and wrap them on the biggest wire. Finally sew all together, to be sure, that nothing fall down. 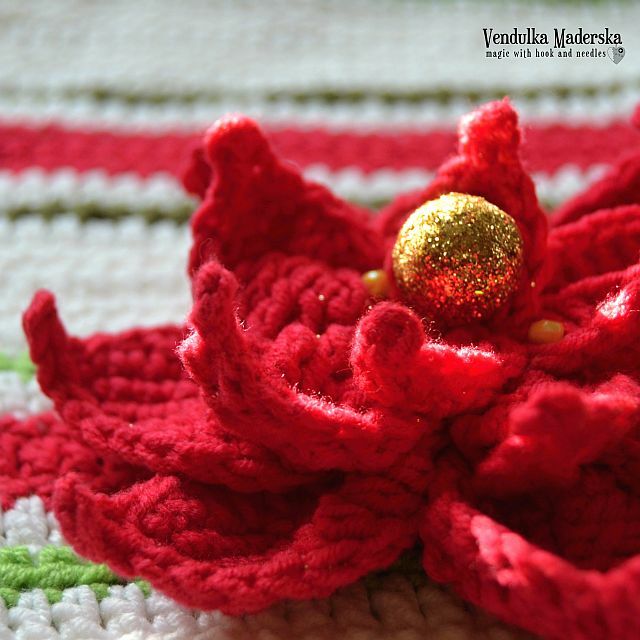 So you have prepared your red poinsettia embellishment. 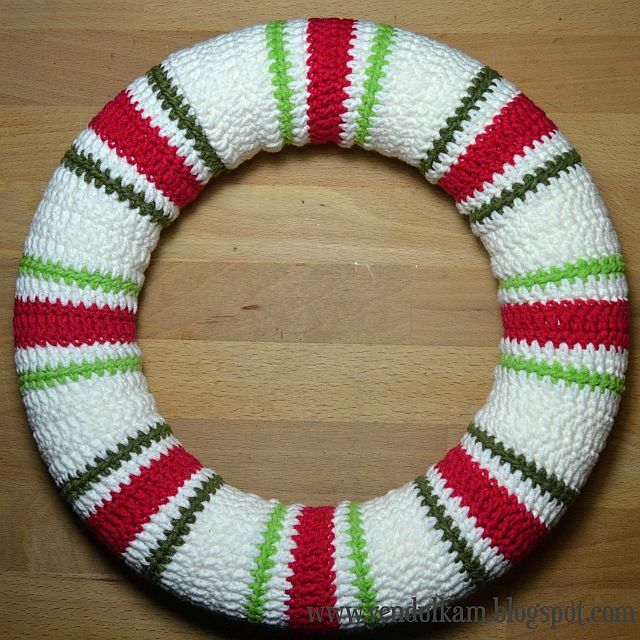 Place it on your wreath and you could sew the wire, or you could use glue gun to fix it. This time, I used glue gun. I added some winter spices - I love that smell :-) and I added some glitter polystyrene stars and balls. I sticked it to the wreath and fixed it by glue a little bit too. Beautiful, Thank You so much! A nice Christmas gift for someone who has everything!! I love this! You are so talented! Thank you for the tutorial!